Synology NAS devices are quite popular among computer users. There are both multi-disk NAS solutions for business, and small 2, 4-disks NAS devices for home users. Unlike other NAS brands, most Synology NAS models use their own technology to combine disks into a single storage - Synology Hybrid RAID (SHR). The technology makes it possible to use disks of different sizes in the same storage device which is achieved by creating several RAIDs on member disks and combining these RAIDs into a JBOD. As to data recovery, the SHR technology complicates the process only if disks of different sizes are used. 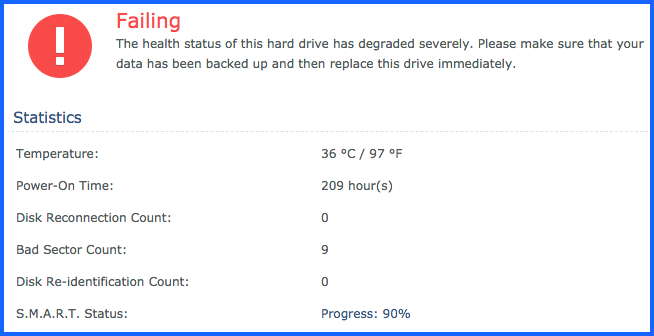 For such NASes, if RAID metadata (md or LVM) is corrupted, DIY data recovery is almost impossible. The best result is to recover data from the first RAID. For Synology NASes where disks of the same size are used, the recovery process is the same as for NASes without SHR. Moreover, Synology NAS devices have one more difference: some models, like DS916 +, DS716 + II, DS716 +, DS416play do not work under the well-known ext filesystem, but operate under the btrfs filesystem which is still a fairly new filesystem meaning that it may still have bugs and there are very few DIY btrfs recovery solutions. ReclaiMe File Recovery is one of the few data recovery tools that can recover data from btrfs-based devices. If you see that the light bulbs on the device flash unusually, for example, you always see green lights, but now they are orange, most likely this is a symptom of Synology NAS failure. Prepare enough cables for connecting disks. It's better to use SATA cables and connect the disks directly to a PC motherboard, but if you do not have enough free ports on your motherboard, you can use USB-to-SATA adapters. Also, prepare the additional storage device, to which you will copy the recovered data - external disks or another network storage, or something else. Remove the disks from the Synology NAS and connect them to the PC running Windows OS. 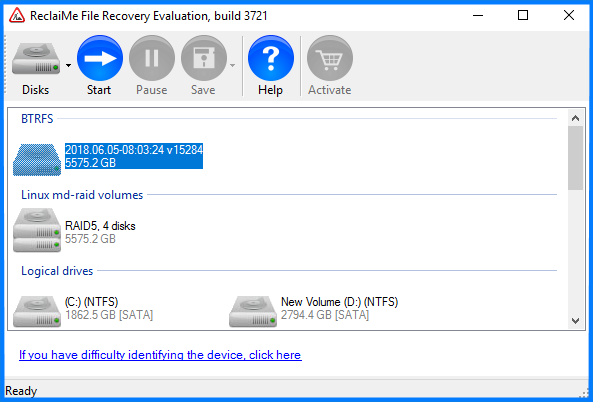 Download and launch ReclaiMe File Recovery software. Select the Synology volume in the ReclaiMe window showing the available disks and partitions. For Synology NAS devices, look for the volume under the Linux LVM or BTRFS sections. Wait till the software starts bringing data. Note that ReclaiMe is designed to bring data earlier into the scan and so you do not need to wait till the end of the scan. Typically, you get all the files within 3-5%. Check the recovery quality by previewing the files. Note that some files, for example .doc or .pdf files are displayed in hexadecimal view. However, all standard image files (.jpg, .png, .tiff) are displayed in the usual way. If pictures of a quite large size (~ 500KB) are displayed good, most likely all other files are good as well. Purchase the ReclaiMe Ultimate license key and start to copy the recovered data. If you do not see the appropriate volumes in ReclaiMe File Recovery, most likely Linux driver metadata is significantly damaged. In this case, first you need to recover RAID configuration using ReclaiMe Free RAID Recovery. When the parameters are determined, select "Run ReclaiMe to recover data" in ReclaiMe Free RAID Recovery tool and back here.